Systems approach, systems thinking, system solutions – almost everybody has heard of these notions. And while many people find these ideas useful, only few fully comprehend them. So, what is the systems approach really about? Imagine that driving through the city, you get stuck in a traffic jam. You back up your car to try another way and… come across another traffic jam. A guy honks at you, making you want to kill him, and you finally realize that you are trapped in a chain of related events. If you could just step back and see the city from a bird’s-eye view! Then you could probably find the possible escape way more easily. This elevated view of an object from above is the first step in the systems approach, which enables us to see the entire “system” of communication in the city. While details become less important, you start to notice recurrent patterns – a whole picture emerges. Systems thinking requires broadening your perspective both in space and time. You will discover then that in the years 1989-95, there was an 11-fold increase of a gasoline price, and a 72-fold increase of a tram ticket price. At the beginning of the nineties, the ratio of people using private transport to people using public one was 1-9, while in the mid nineties it was already 3-7. In retrospect we are able to see that the problems we are currently facing have emerged as a consequence of our past decisions. It is not some external force beyond our control that causes trouble, but us. When we pour too much milk into the glass, it is enough to take a cloth and wipe it off. The problem is limited to this very moment in time and to this specific table where the glass stands, thus it can be solved in a blink. Such an immediate solution, however, cannot be proposed in the face of complex problems. The systems approach would reveal that the consequences of a given problem are often distant in space and time. A forest fire in Ukraine has been caused by smog over Warsaw. Smog over Moscow, caused by underground peatland fires, has been a consequence of the decision to dry the marshes, which was taken 40 years before. Our today’s transport problems stem from the spatial and organizational structure that was being deliberated and decided on over many years. While forcing our way through the congested city, our thinking is processed “linearly,” we try to identify a cause and an effect; “If I turn right, I will be stuck in the traffic jam. If I turn left, then I would stand a better chance of getting at work on time”. Planners often think in such a linear way. 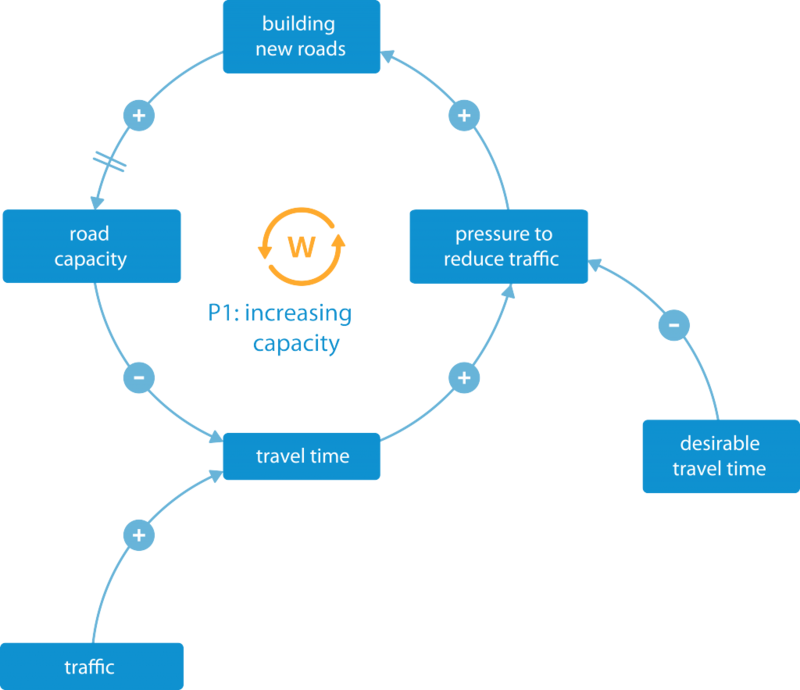 “If we build more new roads, the traffic jams will disappear.” But is this really so simple? Figure 1. The process of building new roads. The arrows indicate cause-effect relationships. The double strikethrough sign denotes a delayed effect. The plus sign next to the arrows means that both variables change in the same direction: a cause increase involves an effect increase. The minus sign means that the direction of change is reversed: a cause increase involves an effect decrease. The loops are marked with letter P and numbered. Looking from a broader perspective, we begin to understand that every effect is at the same time the cause of another event, and every cause is also the effect of some other event. We arrive at the picture consisting of cause-effect loops. Figure 2. Why does the construction of new roads bring no expected results? A good indicator of road congestion is average travel time. Each of us has his or her own idea how long travel should take. Existing divergence make us exert pressure on the authorities to solve the problem. The construction of new roads increases the overall capacity of the communication system, and the situation improves (P1). Unfortunately, only for a short time. Shorter travel time attracts more car users. When the roads become more passable – we use a car more often to run some little errands (P2). Instead of doing shopping in a nearby store – we drive to the hypermarket to the suburbs. 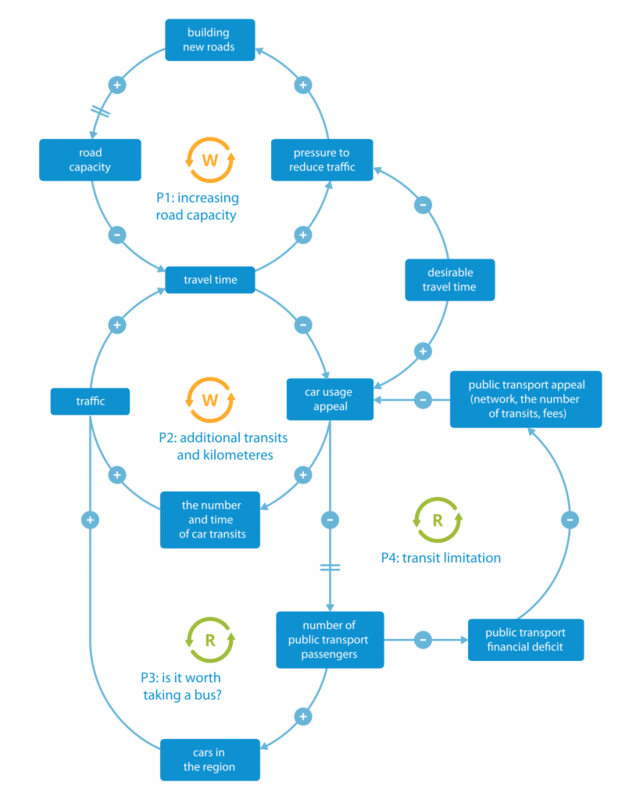 Consequently, average travel time increases (P2), more people buy cars, resigning from public transport (P3). As a result, traffic gets even worse. Meanwhile, the income of public transport companies drops, and the quality of service (P4) deteriorates. This further enhances the attractiveness of using cars. We enter the death spiral of public transport, and the greater road capacity is soon inhibited by the traffic increase. Figure 3. Systems approach metaphor – an iceberg. The system’s behavior stems from its structure. An iceberg provides a good visualisation of systems thinking2 (see: Figure 3). 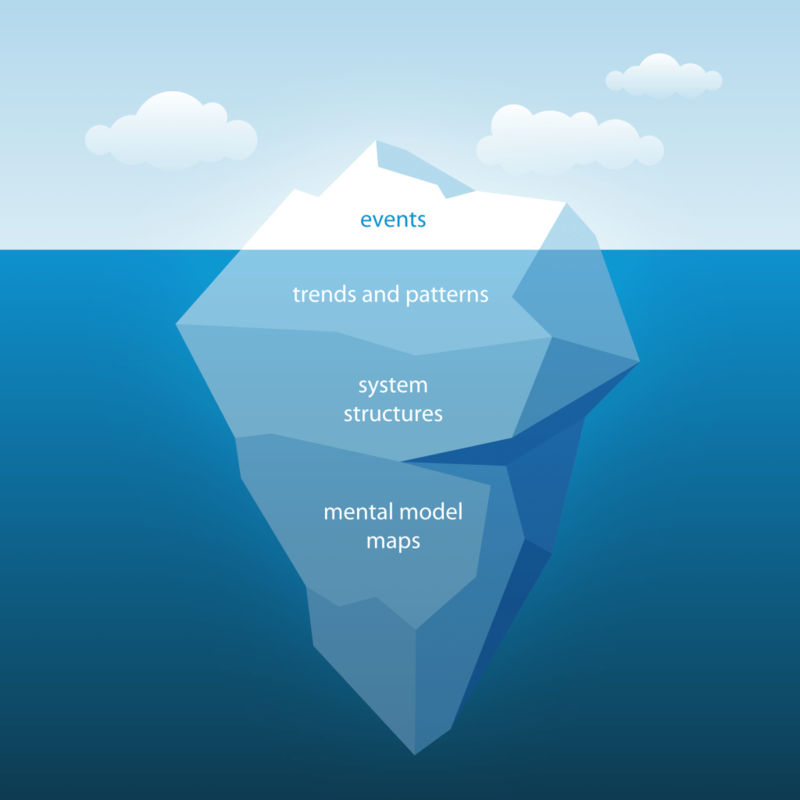 Focusing on events alone, we see only the tip of the iceberg. This is where the majority of political, social and business discussions take place. By broadening the perspective in time and space, we dive deeper and start to analyze trends and patterns. Coming even deeper down, we are able to recognize the system structures that determine its behavior. Such a structural analysis is possible thanks to the systems diagrams, like the one represented by Figure 2. These diagrams are also called “mental model maps”. The mental models represent our deep-rooted beliefs and ways of perceiving and thinking that are so “obvious” to us that we often do not realize their existence. “One cause produces one effect.” “Technology can solve any emerging problem.” “The effort I took determines the effect.” “Individuals have no power to change anything.” These are some examples of mental models. The analysis of mental models is the deepest level of systems thinking. It is often very difficult, as there are many defense mechanisms that hinder the possible change of hidden assumptions. Yet it is the mental models that the structure of the system stems from. Model presented in the book: Sterman J., Business Dynamics: Systems Thinking and Modeling for a Complex World, Irwin / McGraw-Hill, New York 2000. Based on: Senge P., Fifth Discipline, Economic Offices 2003.